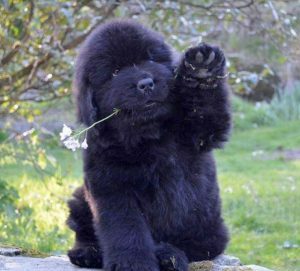 Thank you for your interest in purebred Newfoundlands. Below you will find a list of breeders who have notified the Newfoundland Club of New England that they occasionally have puppies, and wish to have their contact information posted on the NCNE website. The Newfoundland Club of New England does not endorse nor recommend any of these breeders. This is merely a listing from within the membership of the club to assist you in your search for a Newfoundland puppy. All breeds are susceptible to a number of different health issues. The Newfoundland can be affected by orthopedic, cardiac, endocrine and other disorders. These may be attributed to hereditary, congenital or environmental factors. You, the consumer, must do your homework and research the breed. A responsible breeder will welcome your questions regarding the health, temperament, and quality of their dogs. The discussion should include information about feeding, grooming, training, socialization and veterinary requirements. The breeder may even help you decide that a Newfoundland is not for you. Open communication is the single most important factor in the breeder/owner relationship. The Newfoundland Club of New England has many activities during the year that assist new owners with their dogs. These activities are open to everyone interested. Please check the Upcoming Events section of the website to find the dates of these activities and feel free to contact the chairperson for more information. Ask your breeder about Newfoundland Club of New England membership. Fliers and pamphlets regarding responsible dog ownership, and specifically Newfoundlands, can be obtained from the American Kennel Club (www.akc.org) and the Newfoundland Club of America (www.ncanewfs.org). Good luck in your search for your Newfoundland puppy. We wish you many happy and healthy years together. The Newfoundland Club of New England does not endorse, guarantee, nor recommend any of these breeders. This is merely a listing from within the membership of the Club of breeders who have met initial criteria, paid a fee and signed an agreement that they understand and acknowledge the expectation of the Club as to the responsibilities of a breeder. All have agreed to abide by the Ethics Guide. 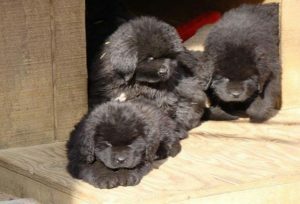 Most breeders listed offer black Newfoundlands. The letter following the kennel name indicates any other colors that may be available with the following abbreviations being used: L= white and black (Landseer); Br = brown; G = grey.